The dream: Build 9 apartments for rent to be able to go home to the Philippines and live comfortably in about 3 years. We wanted the houses to be big and of good quality. The sacrifice: Budget, budget, budget. No skiing holidays, no new clothes, no unnecessary expenses, no restaurants, nothing of anything for the past 4 years. Even here in Zürich, money doesn't fall from the sky. Salaries are high but everything is so expensive anyway so we need to monitor each expense. I lived more luxuriously in the Philippines to tell you the truth. Here, I can't even afford to have a manicure! 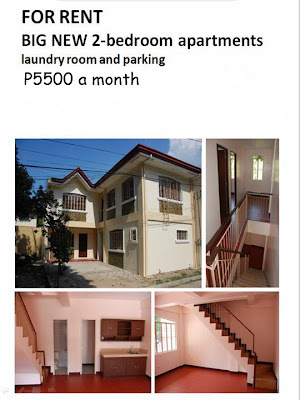 The reward: We finished building our first 3 apartments in Los Banos, Laguna last January. Yeeppee! THE DREAM is turning into reality. The reality: After so much trouble with the contractor (after he took our money, he disappeared without finishing the work), finally our apartments were built. Now, it turns out that our apartments are too big and too expensive. Even after we lowered the rent, prospective renters find it too big and too nice. Huh? So, our apartments have been empty for a year now. I guess we have to reformulate THE DREAM. Si Julianne 'to, kabarkada ni Cherry from HS. madami na din kasing tumatayong mga apartments/units, and usually ang hinahanap ng mga estudyante eh yung pinaka-mura na. San pala banda yung apartments niyo? yung kasing sa parents ko (Revilleza apartments), ni-renovate nila yung bigger unit and made it into 5 studio units...may sariling toilet pero common and cooking area. mas steady ang mga tenants nila don. sana maka-hanap din kayo ng tenants. sayang naman, it looks like a nice place and a very good investment para sa inyo. Thanks for the kind words. Our apartments is just in front of our house. Actually, for an apartment like that, that's too cheap!I wish you would plan to build here in Quezon City and could be rented for the same price! Well now, that's my dream, hehehe!